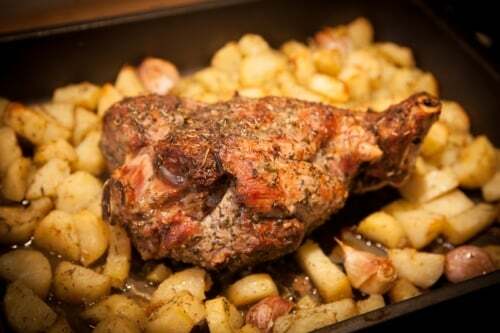 Today, we’ll take a look at a very traditional French leg of lamb recipe: le gigot d’agneau Pascal. In case you were wondering, let’s be clear: “Agneau Pascal” does NOT mean “Some guy named Pascal’s recipe for leg of lamb!” but rather the lamb that is traditionally cooked for Easter (called “Pâques”) holiday. You’ll find several variations of this leg of lamb recipe in countries around the Mediterranean (my favourite being the lemon based Greek leg of lamb, but I’m biased with my ancestry). The good news is that as far as holiday meals are concerned, this is probably one of the simplest and fastest to make: The whole recipe requires just 5 ingredients and less than 15 minutes of preparation! Now you can of course spruce it up a little (which is what I do) but the basics of the meal is super simple. Run the leg of lamb under cold water to remove any stickiness of the meat and dry it well with paper towels. Removing all the excess moisture will make for a crispier outside when cooking. With a long sharp knife, make an long thin incision in the meat and insert the garlic into the opening. (I also like to add a couple of leaves of fresh rosemary too but not everyone likes that stronger taste). This is called “piquer la viande à l’ail” (literally to pierce the meat with garlic). Put the leg of lamb in a large oven dish (“Un plat”) and add some olive oil (not too much, lamb already has lots of natural fat) and generously sprinkle pepper and, optionally, the “herbes de Provence” on every part of the roast. With the oil, all the pepper and herbs will stick to the meat making a sort of crust. Just before you put the leg of lamb in the oven, sprinkle the whole roast with salt. Put in the high temp oven for about 20 minutes to develop a nice crust (“une croûte”). This will prevent juices from flowing out during the cooking and add flavor + visual appeal. 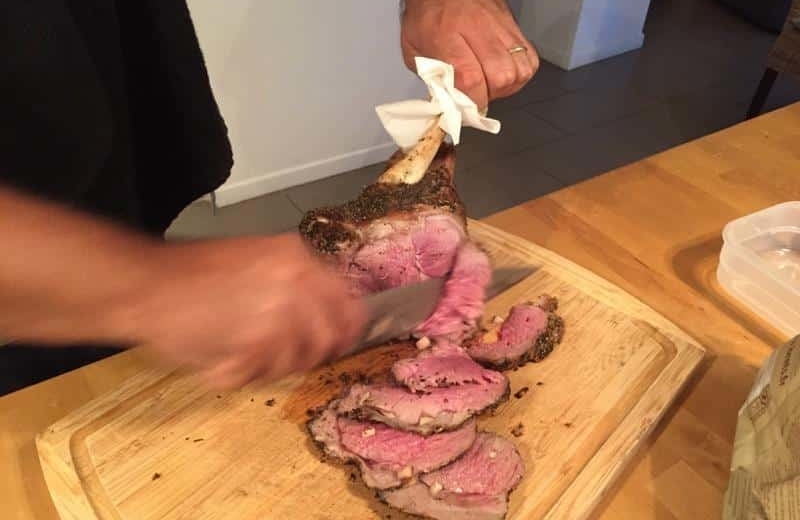 Cook your leg of lamb for about 12 to 15 minutes per pound (o,5kg) depending on if you want it pink or 18 minutes if you want it well done. In the middle of the cooking, you can flip the leg of lamb once if you’d like. Once you take the “gigot” out of the oven, take it out of the pan and cover it with tin foil (“papier alu” – short for aluminium). Let it rest at least 10 minutes for the juices to flow back into the leg of lamb meat. In the meantime, you can dump most of the fat that is left in the pan and put the pan on the stove at a low heat (make sure your pan allows that). Then add a large glass of chicken stock (or I prefer to add red wine) and deglaze the pan, scraping all the good bits from the bottom of the pan, let it reduce, season if needed and serve as a nice simple sauce. 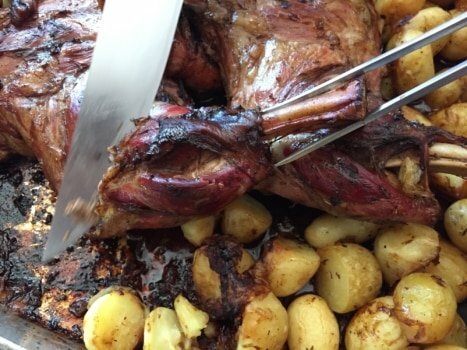 As with most of the meats, the French will usually eat gigot d’agneau “rosé” (pink) whereas the easter leg of lamb in Greece is always eaten well cooked through… It’s a cultural thing I guess. We like our leg of lamb well cooked through in my family, so that’s what I made. If your leg of lamb is really big, it may be too pink to your liking closer to the bone. Just put it back in the oven a bit. What is “la Souris” Part of the Gigot d’Agneau ? The triangular shaped part next to the tip of the bone is called “la souris”. The meat is different there, and French people usually fight over it (it’s definitely Camille’s favorite !!). So you may need to cut this part in smaller pieces so everybody can get a piece. 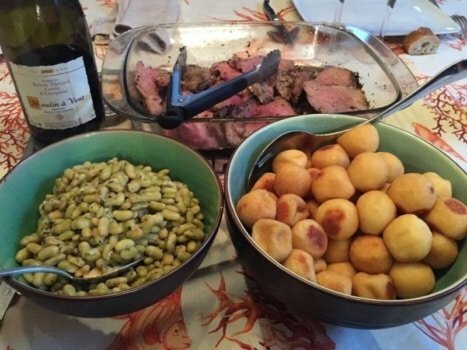 The Gigot d’Agneau Pascal is traditionally served with Flageolets (pale green beans) and pommes de terre dauphines (another French delicacy…see picture below). And it makes wonderful leftovers for sandwiches the next days! How do you say “white” and “dark” meat in French? How to comment about food in French?